1. Why change it? It looks even more generic. The old launcher had advertisement before you launched the game, and it was a great synopsis on what was going on before starting the game. 2. Anyone have the same issue where it will not save your password? I have to constantly enter my password to log in even if I check the button to save my credentials. 3. Why did they change it? Who the f is Titan Forge?! Ummm smite texture DLC? What does that mean? Also, what are the other 2 options in Spanish and the one about Brazil? WTF? And command line extra?! Probably something to do with steam. Maybe Steam doesn't like advertisements on launchers or something. 2. Anyone have the same issue where it will not save your password? I don't even have a new launcher... Still using the same old one. Maybe 'cause I use the stand alone? Titan Forge is the new team from Hi-Rez which will work exclusively on Smite. It's what Hi-Rez have done to prevent having a game be left to the wayside as a cash cow and fund resources into other, more profitable games. Every single Hi-Rez game now has it's own team to work on that game full time. Minimize to tray just means that when you minimize the game, instead of it going to your taskbar it instead goes to the desktop tray (Next to the clock in the bottom right of your desktop) and will use less resources to stay running. Ummm smite texture DLC? What does that mean? Maybe it's just a vestigial checkbox for now. Can't rightly say. Also, what are the other 2 options in Spanish and the one about Brazil? WTF? 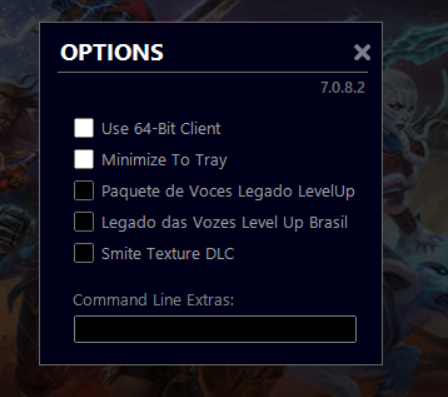 Something Portugese about Legacy Level Up Voice Packs. I assume one is referring to a Brazilian dialect. But I don't speak well... Any language aside from English (Even then... Ehhh...) so there might be some room for interpretation. For adding extra command lines to be loaded when the game loads up. For example, you can use -dx9 to make it use DirectX9 if you wish. Players will be able to download a High Resolution Texture Pack DLC that will provide more detail than before and will be especially useful to players using a 4K display. To use the High Resolution Texture Pack, open your launcher and go to “Manage DLC”. Check the High Resolution Texture Pack and “Apply” to begin your download. Once in game, ensure your texture detail setting is set to “Maximum” to enable your downloaded High Resolution Texture Pack. 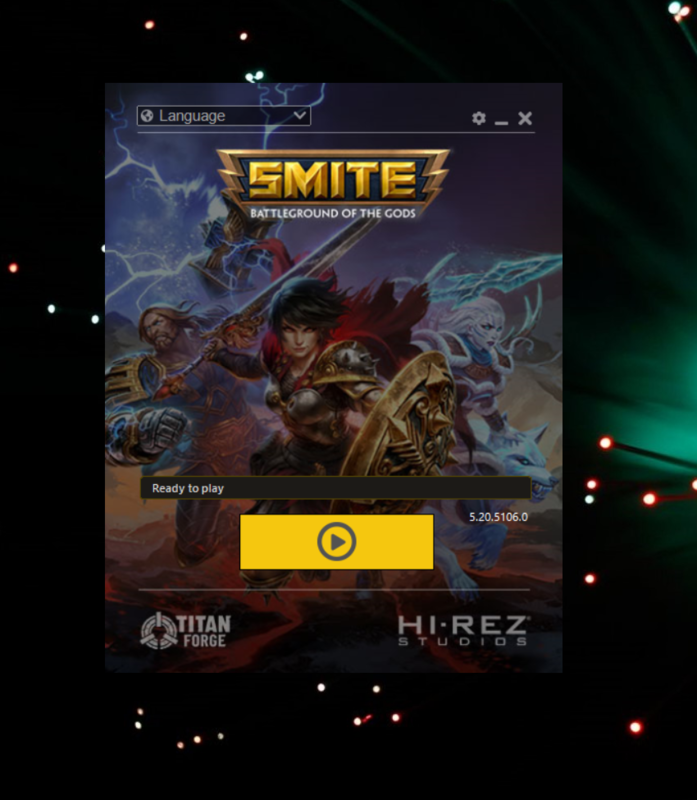 I use Smite through steam and don't have a new launcher at all. Still the same old one for me. So its not just steam people. How are you guys still using the old launcher? Mines just updated automatically. Thank you for the responses btw and the links. Oh steam users you say? So if you have Steam it updates it? Well FU Steam LOL. But alas, I have retro games I play on Steam so guess I have to deal. I can't seem to tell the difference between High Resolution Texture Pack options, but guess I'll stick to with texture packs. No I am saying steam doesn't have your launcher. We have the same old one as before. Steam never updated anything launcher wise. Hope you get yours all situated and figured out though. Im not linking mine cause if I say I forget my steam password, and just say for instance I can never figure it out and I cant change the password or something weird, they have now introduced the new thing where you can link the account and you cant login if its a different steam account. So if I make a new steam account I could never log in to my old smite. So yeah its probably a linked thing, and they need to stop asking me everytime I log in to link, cause I wont be doing that. They aren't going to bully me into doing something I don't want to do. Needs to be a Dont ask me again. Check box but that will never happen.